Schlotzsky's celebrates 47 years of business by offering customers a small The Original sandwich for $1.99 on Tuesday, October 2, 2018 at participating locations. In addition to the one-day deal, the first 200 guests at each location will receive their sandwich on a Frisbee (which is how they served it back when they first started). You can double the meat on the sandwich for an extra $1 charge. The Original was the only sandwich that Schlotzsky's offered when they first opened back in 1971. 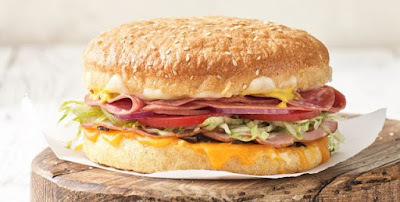 It features smoked ham, Genoa and cotto salami, cheddar, mozzarella, parmesan, black olives, red onions, lettuce, tomato, mustard, and Schlotzsky's signature sauce on a toasted sourdough bun.